Sometimes I wonder if I have enough “authority” on a subject to write a post & make certain recommendations. On THIS subject though of illness & what is helpful, I can speak with conviction as I am undergoing 2+ year process to tackle my case of aggressive breast cancer that was discovered last Spring. I was bowled over by the outpouring of love and truly helpful things that my friends & family sent me to lift my spirits. Some of the things I received were really unexpected & amazingly helpful, so I wanted to pass along a few highlights. (There were MANY more, so if this is of interest, please let me know & I’ll add more to the running list soon!). 1.) A lucky charm. Perhaps THE most touching gift I got was from sweet Eve, my husband’s god daughter who had just finished 8th grade. Eve sent me an exquisitely heartfelt note along with a Giving Key that a friend had given her when Eve's dad died in 2014. I knew nothing about The Giving Keys when this gift arrived, but I now know it is an amazing philanthropic company started by Caitlin Crosby. 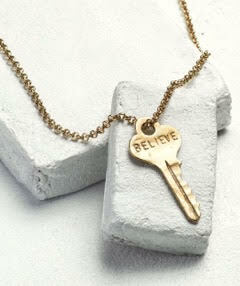 Inspirational words are engraved on ordinary keys, which you get as a necklace, bracelet, etc. Ours says “Believe” & I wear it to chemo appointments or any day that I need a little extra faith. When I graduate from treatment, Eve & I are planning to jointly pick the next recipient, which is what The Giving Keys founder hopes will happen with all these talismen! 2. Something to pamper. Another great gift I got that I would never have thought of was a care package that included some really gentle baby products. When you are sick, you often can’t handle strong fragrances & your skin really can’t take anything too much either. This bottle of Baby Soothing Oil from Gregg Renfrew’s incredible company Beauty Counter can be used on dry hands (a hallmark of chemo treatment) or face/body. It has a lovely, very mild/natural scent & I have to admit I feel very pampered & taken care of every time I smell it. 3. 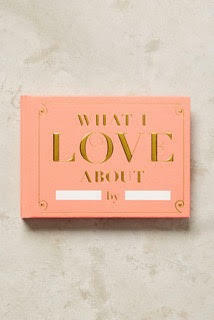 A journal or pretty notebook. If a friend is going to be home for a while or is juggling a longer-term condition, a notebook can really come in handy. Whether it’s used to scribble notes from doctor visits or bedside as a journal to capture all the mixed emotions of illness/healing, it can be really useful AND a constant reminder that you are with them. I got a beautiful floral one from my friend Mitzi & every time I use it I think of her (who also went through cancer treatment & beat it!). 4. Another awesome thing that people sent me were pajamas! No matter how great your friend’s current assortment of nightwear, she will really appreciate something fresh & new. One friend who shares my passion for France sent along some adorable PJ’s from Bedhead that were imprinted with the Eiffel Tower. Every time I wear them I think of memorable trips there & hopefully many more to come. A robe. Think of this as like an everyday coat for your friend while she’s recovering. A fluffy new one is a godsend! This one from Nordstrom’s is all-cotton (which I personally prefer, especially when I’m sick - who wants polyester when you want to be cozy?!) and costs less than florist delivery. My aunt Pat sent along something like this & it is heaven. 5. Something personal. My sister Carole made me an amazing scrapbook, or what she & I have always called “cahiers” where we do collages of our favorite decorating & design images in same way that our late mom used to when she was an interior designer. Other people sent along favorite photos to jog fun memories & get a smile out of me when I was really struggling. Why not frame a great pic of your friend (or even her kids, pets if she has any)?? I use Framebridge my friend Susan Tynan’s company, which is super easy — you can do it all from your laptop, using any photo on your computer or even Instagram! A couple of Instagram mini’s on your friend’s bedside could be a minor miracle for her on tough days.